The world is becoming “flatter” by the day and schools are now focusing their efforts on preparing students to participate, interact, and thrive in a global society. With the goal to support schools in accomplishing this task, EdSteps, led by the Council of Chief State School Officers, created the Global Competence Matrix as a tool for teachers to use to help build Global Competence into their students, classrooms, and schools. Global Competence being the capacity and disposition to understand and act on issues of global significance. The matrix focuses around 4 main areas, the definition of each, and how students might demonstrate their ability to meet those expectations. 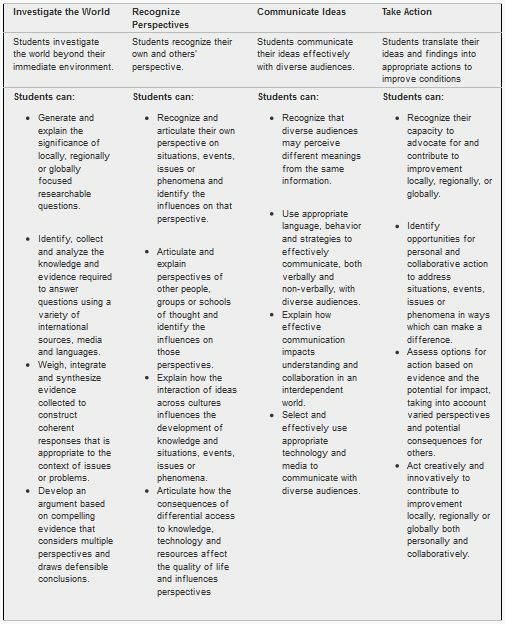 Find the Global Competence Matrix PDF and see the Global Competence – Content Area Matrices PDF for more detailed examples for Communication Arts, Math, Science, Social Studies, and more. If you are interested in helping build an archive of authentic examples, you can visit the site to submit work samples. As you begin thinking about incorporating Global Competence into your classroom lessons, in what ways does this mesh with what you are already doing and where might you need to adapt?